At Medical Center Eye Clinic, we strive to provide the best family eye care treatment and prevention services possible. Whether you need a routine eye exam, glasses, contacts, or treatment for cataracts, glaucoma, or other eye disease, our professional and experienced staff have the expertise needed to provide the high level of care you deserve. We want to be your eye clinic in Salem, and our commitment to the patient means you’ll never feel rushed or hurried during an appointment. Our board certified of ophthalmologists take the time to answer your questions, so you’ll feel comfortable and confident in the treatment you receive. We want every patient to leave Medical Center Eye Clinic feeling as if your needs have been met and expectations exceeded. Our practice is like a family. 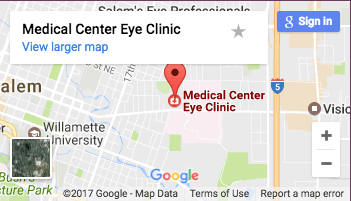 Medical Center Eye Clinic was founded in 1967 by Dr. E.T. Sornson, one of the finest, most upstanding individuals you’d ever want to meet. Growing up on a farm in Iowa, Dr. Sornson was instilled with traits like honesty, hard work, and a dedication to help others. Dr. Sornson brought those traits and like-minded individuals together when creating Medical Center Eye Clinic. He was joined by Dr. Stevens in 1974. We’ve continued to carry on the values and principles of Dr. Sornson and Dr. Stevens that have become the very foundation of our practice. Our staff remains committed to providing outstanding care, treating every patient with respect, and making sure we go above and beyond in making your eye health our top priority. That’s our Medical Center Eye Clinic difference.